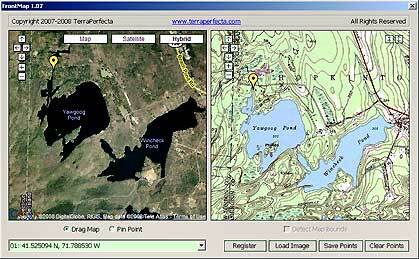 FrontMap is an unique map calibration tool and produces .map files compatible with Ozi Explorer. No need to know anything about datums, projections, central meridians and other stuff. It utilize calibration-by-example method: you see sattelite image of the territory and say "It is here!" Left window contains Google Map. Right window - your map image to be calibrated. You have to find the same territories on the map image and Google Map. Select "Pin Point" after that. Click and drag a point from the left window to the right one. Drop on the map image the point. 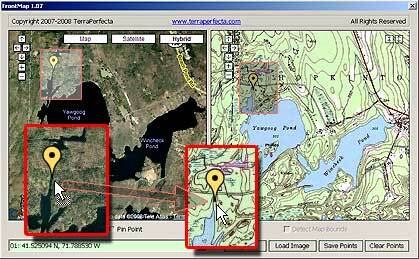 Repeat it at least three times for each recognizable terrain object prefferably in the area of map image corners. It is required to have at least 4 points to produce precise calibration (unregistered Ozi edition will save only 3 points). Note: do not use this tool to calibrate large territories like whole countries or states. In such cases you will observe significant errors. This feature works fine on color map images and may fail on monochrome images. You can download FrontMap for Windows platform here. Please contact us if you have any questions. Additional features available in the full version only.